How many of us, if we were to take a look around our desks right now, would find a jumbled mess of wires connected to a monitor that, quite frankly, takes up more space than it should? 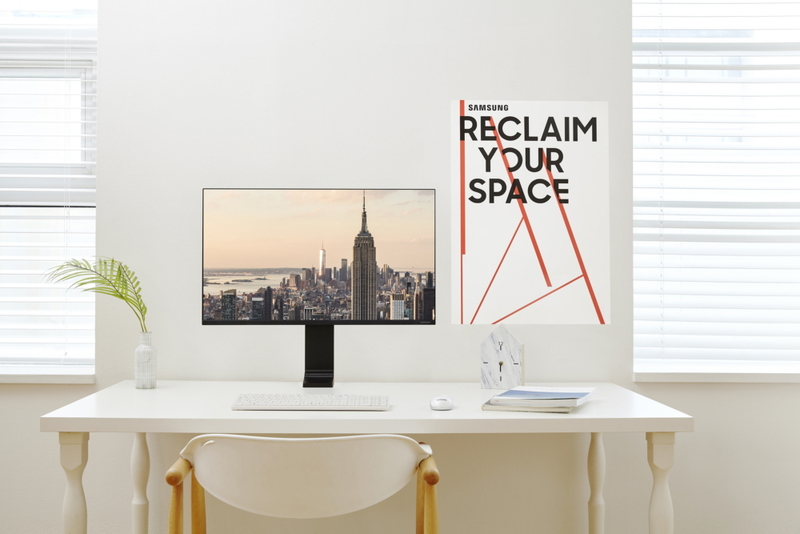 Introduced at CES 2019, the new Samsung Space Monitor was designed to put an end to messy desks – and space-hogging screens – once and for all. Combining a clean and sleek design with powerful performance, the Space Monitor allows users to work more productively – and game, browse and stream more comfortably – by making it easier to focus on what’s on the screen, and not what’s surrounding it. To get a better sense of how the monitor helps users reclaim their workspace, let’s take a closer look at some of its key design features. The Space Monitor was designed, from top to bottom, to reduce clutter and maximize desk space. It does this, in part, by borrowing user-favorite design elements from Samsung’s award-winning QLED TV line, including discreet cable management (more on that in just a moment), and a wall-hugging design that creates more space to work. Just how much room does the monitor’s ergonomic form free up? 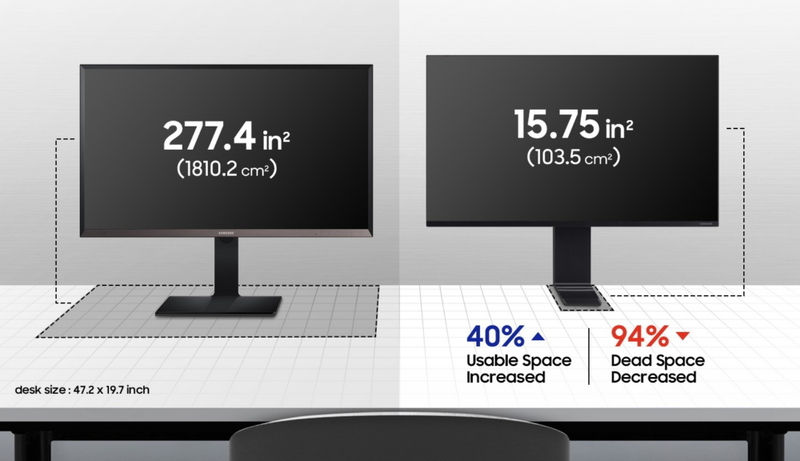 Compared to a conventional monitor of equivalent size,1 the Space Monitor offers users up to 40 percent more usable surface area – and makes it that much easier to maintain a clean desk. The Space Monitor’s zero-level HAS (height-adjustable stand) allows users to quickly and easily raise or lower their screen to whichever position is most comfortable for them. Whether you’re editing a document or catching up on the latest binge-worthy show, the stand’s best-in-class adjustment span makes it easy to find the best possible view, allowing you to adjust your screen from a height of 8.4 inches above your desk all the way down to surface level. The ability to lower the monitor so that it rests on your desk is especially handy when working with a laptop, as it enables users to comfortably view both screens on the same level, reducing eye fatigue. The versatile stand also tilts back and forth to provide an optimal viewing angle at any height. And because the Space Monitor’s design is all about maximizing, well, space, once you’ve finished your task and you push the monitor against the wall, the stand neatly folds into the back of the screen. Cables are key contributors to workspace clutter. Not here, however. The Space Monitor’s ports are easily accessible, and cables are discreetly hidden from view via a groove in the stand. Best of all, setting up the monitor couldn’t be simpler, thanks to an integrated clamp at the base of the stand that allows the device to be securely attached to desks and tables of various thicknesses. 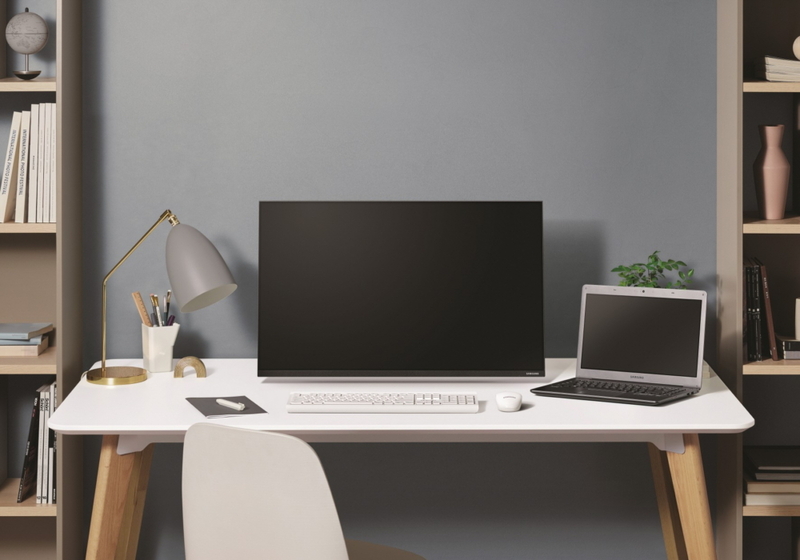 Featuring a slim panel that’s bezel-less on three sides, the Space Monitor’s frame-like form adds an elegant touch to any office – home or otherwise. 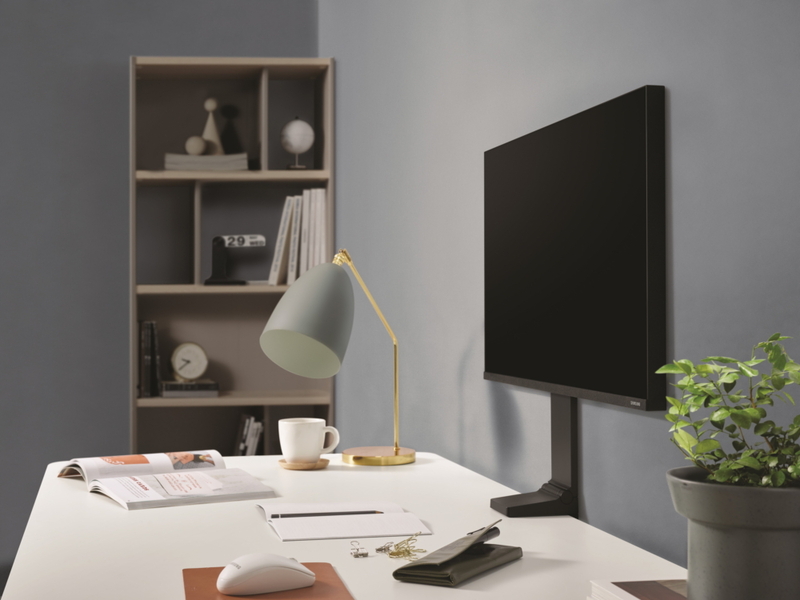 The combination of stylish and space-saving design cues also makes the monitor an ideal solution for hotel business centers, reception desks, libraries, and anywhere where work space is at a premium. The Space Monitor’s understated design is complemented by eye-catching specs. Both the 27-inch model’s WQHD (2560 x 1440) resolution screen and the 32-inch model’s 4K UHD display offer lifelike, pin-sharp images, as well as ample space for viewing documents and webpages, with less scrolling and zooming. Gamers in particular will appreciate the 27-inch model’s fast, 144 Hz refresh rate, which ensures flawlessly smooth visuals for fast-action gaming. Both Space Monitor models also feature high brightness and support for over one billion shades of color, presenting photos, videos and games in vibrant detail and stunning contrast. The Space Monitor is available to preorder now through January 11 via this link. 1 Measured in a side-by-side comparison with the Samsung SD850, on a 47.2 x 19.7-inch (120 cm x 50 cm) desk.